HEAPS OF FUN! 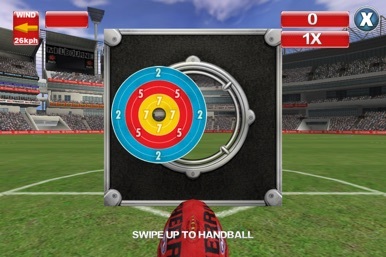 The ultimate iPhone, iPod Touch & iPad AFL experience! 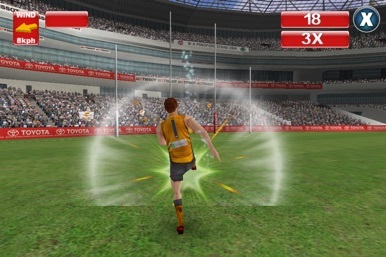 Test your AFL skills and boast your triumphs with AFL Mini Games, brought to you by Tru Blu Entertainment and Wicked Witch Software. Score the winning goal in SUPER KICK, sharpen your aim in PERFECT PASS and sidestep the opposition in ON THE RUN! *Supports iPad, iPad 2, iPad 3, iPhone 4S, iPhone 4, iPhone 3GS, iPhone 3, iPhone 2G, iPod Touch 4th Gen, iPod Touch 3rd Gen, iPod Touch 2rd Gen and iPod Touch 1st Gen.
*Requires iOS Firmware 3.0 or later. Offers three addictive mini games for triple the action and fun right from the start! 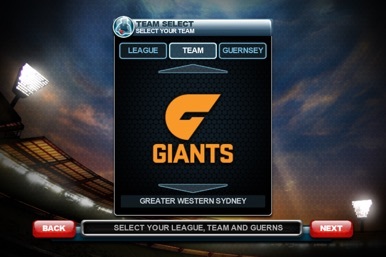 With ongoing support and updates, you will have a load of AFL fun at your fingertips forever! Feel the excitement as you line up for that record breaking goal. 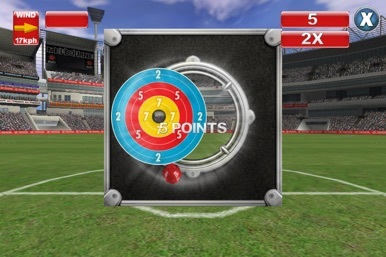 The angle is sharp and the wind is high, have you got the strategy and skill to make the final goals!? Feel the adrenaline pump as you charge down the field! 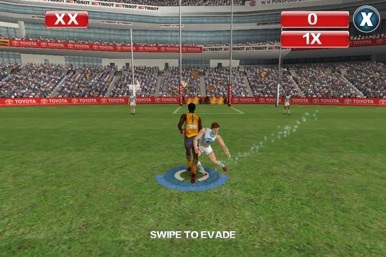 Opposition player’s chase, flank and tackle you head on in a desperate attempt to bring you down before you kick for goal in this exciting, fast paced evasion game. ☆ Competition – Kick goals, aim and pass or evade tackles: 3 strikes and you're out! ☆ Endurance – You are given more chances: 5 strikes and you're out! ☆ Last Chance – The ideal mode for a challenge: In this mode there are no second chances. ☆ Count Down - A race against the clock: Get the most goals, precise handball or evasions in the limited time available. ☆ Bonus Time – A fast paced mode of precision: You don’t have much time in this mode, but scoring will grab you bonus seconds. So you will want to be quick. Challenge your AFL skills and see how you rank against your friends, or for a greater challenge, other gamers from around the world. Features full 3D stadium, goals, ball and players! Motion captured animations create impressive and realistic visuals, while the stylish camera transitions and smooth effects catapult you right into the action!